As the Campaign for Client Protection revves up to officially launch this fall, we stepped out in Colombia to meet with and interview MFI leadership, staff, and clients and learn about what’s being done to ensure that client-protection practices at the heart of the six principles are making their way into everyday client interactions. Client showing amortization schedule to Sergio. During all of our interviews, one principle specifically stood out—transparent pricing. 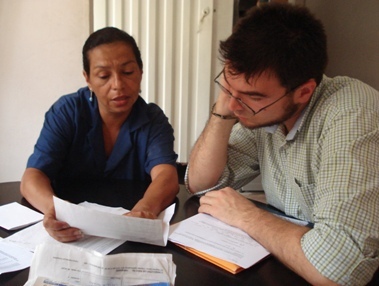 Here in Colombia the institutions we’ve visited have worked diligently to ensure that clients have the knowledge and access to resources to understand the terms and conditions of their loans. In addition to a clear table of interest rates posted on the wall was a point-by-point description of the loan, applicable taxes, and applicable fees. 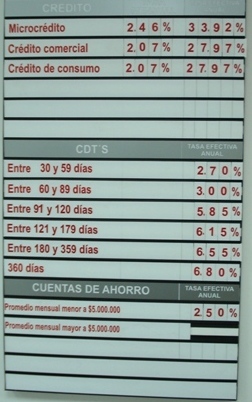 One institution showed clients their requested amount, followed by the required deductions and their costs—taxes (in Colombia, they tax 4 pesos per 1,000 transaction—although the government allows for a person to exclude one savings account from this tax), credit check costs, etc—and then listed the exact amount that the client would receive. The funds are distributed ONLY after the client signs and fingerprints this document. Beyond what the clients learned in the office, however, what really struck us were the resources they took home after making a loan. EVERY client we visited pulled out a payment schedule. These tables detailed the schedule of payment due dates, the amount due, and the remaining balance on their loans. One institution even separated the interest balance from the principal balance. Another listed on this paper the contact information for the Defensor del Cliente, or Colombian ombudsman. In many cases the clients had checked off each payment date as they made the payments. What’s interesting to note is that these schedules of payment are not required by Colombian law—this was an additional effort that the institutions took to ensure their clients knew where their money was going. Table of interest rates hanging on MFI branch wall. Following these interviews we were encouraged to know that the clients were receiving resources to help them understand their loans more fully. However, in as many cases of clients who checked off each payment from their schedule and read their contracts fully, there were clients who did not. And why? Simply, they couldn’t be bothered. They had businesses to run seven days a week and families to take care of. They trusted their institutions, and thus didn’t bother to read contract fine print. For clients, as for institutions, what seems to be the most important aspect of their relationship can be found in a handshake and a respectful commitment to repay on time rather than a legal size document detailing terms and conditions.